I often forget about that squat orange and brown can buried on the top shelf of the fridge, but when I stumble on it I can’t believe how I’ve lived so long without it. 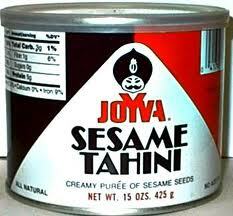 Joyva Sesame Tahini, just add warm water, garlic, lemon juice and salt and you’ve got the most incredibly delicious condiment…and even after opening it lasts for months in the fridge. The hard part is just remembering it’s there. I love it on rice and couscous, chicken and lamb, eggplant and chick peas, or stirred into a salad dressing. It’s even great plain with some pita bread.